Giselle is a tall beautiful girl that raced at 70lbs. Her birthday is May 10th. She has settled into foster home with no problems at all and is very well behaved and quiet. She hasn't had a single accident in the house. GIselle has an old leg break from her racing days that is fully healed but limits the movement of her foot a bit causing a permanent limp. She still enjoys running, playing and going for walks and doesn't let it stop her. Giselle likes the security of her crate and chooses to spend time there. She takes things like toys and newspapers to her crate and stores them there. 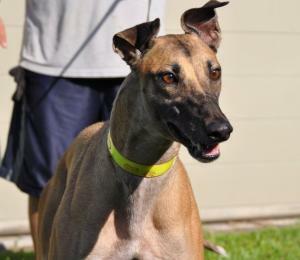 Giselle seems like she would do best in a quiet home. A lot of commotion and wild, loud children would probably be too much for this sensitive beauty.